March 6, 2018 -- As has been our tradition for a few years now on the final day of our congress, we already look ahead to next year's ECR. We, therefore, spoke with Dr. Lorenzo Derchi from Genoa, Italy, who, as incoming European Society of Radiology (ESR) president, is in charge of ECR 2019. He told us about his plans and ideas for the next European Congress of Radiology. ECR Today: Dr. Derchi, next year's European Congress of Radiology will be the 25th to be held in Vienna. Are there any specific celebrations planned that you can already share with us? 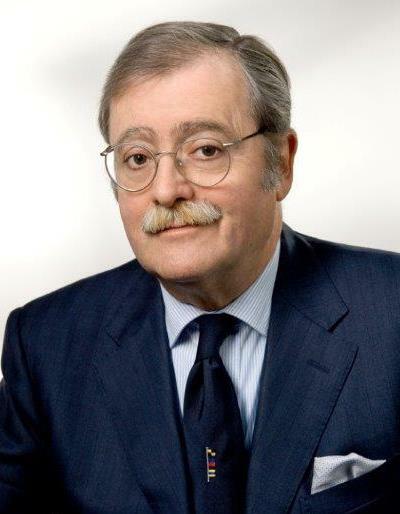 As incoming ESR president, Dr. Lorenzo Derchi, head of the department of radiology at the University of Genoa, will preside over ECR 2019. Dr. Lorenzo Derchi: We are still thinking about them. An anniversary like this is something more than an opportunity for a big celebration. It is the right moment to rethink our history and what we have reached over the years. To always have the congress in the same city since 1991, at first every other year and then, after 1999, annually, has been a radical change. The new formula proved successful, and ECR has become the European meeting to come to in order to learn the latest clinical and technical advances in our discipline, as well as to present the results of the previous year's research. In my experience, however, it has become much more. From 1991 up until today, all congress chairpersons have been part of the same team in a relay race, each handing off the baton to the next one. This continuity can be felt in the special atmosphere at each meeting and has allowed the congress to become the annual appointment to meet old friends and make new ones, discuss any radiological topic and then to start working together on it, and finally a place to meet periodically to share problems, advancements, and results of long-term projects. Were you here for the first ECR in Vienna in 1991? If not, when did you attend your first ECR? What do you recall from that visit? Yes, I have been to all ECRs since the beginning, and I remember that, in 1991, we came by car from Genoa to Vienna. We arrived on the day before the congress and left after the very last session. A "full immersion" experience! I remember that everything was within the Austria Center (both conference rooms and technical exhibition) and that the poster exhibition was on level III of the building. On the last day, I had a long walk-through. Being such a regular visitor to the ECR, could you briefly describe for us the main changes you have witnessed over the years, both scientifically and atmospherically? ECR is getting bigger each year. This is visible by the increasing number of attendees and the increase in space. First there was the Austria Center only, then came the new building in front of the entrance, where we now have the technical exhibition, then the M building, and now the Sky High Stage in the nearby skyscraper as well as the "Cube." The congress organization has been able to find new spaces for the increasing number of attendees, and there will be more. Even virtual spaces have been created: For the last few years, in fact, there has been an increasing number of people attending the meeting online. As I said earlier, however, what is most important is the atmosphere among participants that has been created over the years: We are at home in Vienna, the home where European radiology meets. I think this is the result of two different components: on the one hand the decision to have a date at the same place each year, and on the other hand the fact that each president and Programme Planning Committee has built on the experience of earlier congresses, always adding new ideas and achieving new goals. I take this opportunity to thank heartily the people in the ESR Office here in Vienna: They are the backbone of the congress organization, the right mixture of a well-structured organization, innovation, and technical advancements with which it is a pleasure to cooperate. I have made really good friends at ECR over the years: We started a discussion during a scientific session, next year discussed again and had a drink or dinner together, then developed some scientific project and taking the opportunity at the next ECR to discuss more and lay down the draft of a paper, and so on. ... With some of them we came to know their families and visited their homes. And when science was not the topic, we gained knowledge of how the work of the radiologist is performed in different countries and gained understanding that the problems I have are similar to those experienced by other European colleagues. And that some of the solutions I have found can be useful to them and vice versa. Any particular stories you would like to share? Fond memories? There are many, linked to both the congress and the city of Vienna: my first presentation at a postgraduate course on ultrasonography of the kidneys; the lecture I gave on "my mistakes" in renal imaging; the informal, fiery discussions on the possible causes of nephrogenic systemic fibrosis (NSF) in 2007 held on one of the terraces of the Austria Center; and the meetings between representatives of ESR and those of other societies from all over the world. As regards Vienna, I had the chance to visit some of its most beautiful places: the Belvedere and its Klimt exhibition are my favorites. But what I especially remember are two concerts at the Musikverein: one was the "Passio secundum Mattheum" by Johann Sebastian Bach, and the other was a concert by pianist Katia Labèque and violinist Viktoria Mullova. Like the ECR, you have also come a long way and are now the incoming ESR president and chair of the Programme Planning Committee for ECR 2019. Please reveal some of the scientific highlights we can expect from next year's congress. Always in December two years before the congress, the Programme Planning Committee of ECR meets in an inaugural session to discuss new topics for the European Excellence in Education (E3) program, New Horizons Sessions, State of the Art Symposia, Special Focus Sessions, Professional Challenges Sessions, Coffee & Talk sessions, and Multidisciplinary Sessions. For ECR 2019, we will introduce three new E3: Academies entitled "Hot topics in GU cancer," "Functional imaging from research to medical practice" and "Radiology leaders' boot camp." The New Horizons Sessions are entitled "The role of imaging in the era of liquid biopsy," "Artificial intelligence (AI): driven by radiologists" and "The tumor board of the future." Artificial intelligence will run like a common thread through the entire program. The State of the Art Symposia will cover breast cancer screening and treatment, the pancreatic intraductal papillary mucinous neoplasia, and the forgotten structures in cardiac imaging. Which countries will be invited to participate in the ESR meets program? Do you already know anything about their plans for the sessions? The countries in the ESR meets program 2019 will be Italy, Pakistan, and the entire continent of Africa. Italy is my home country and has been a natural choice. The Italian Society of Radiology (SIRM) is preparing a session dedicated to both scientific and professional topics: The first will underline the role of Italian radiologists in research; the latter will present some aspects of the strong work done by the society to enhance the professional status of radiologists in our national health system. As regards the second country, I have come to know many colleagues from Pakistan here at ECR during the past years and close relationships between the Radiological Society of Pakistan and our society have been created over time. Furthermore, I was at their national congress in 2017 and met a well-organized society with which it is a pleasure to cooperate. Then it became an easy choice. The Pakistani colleagues are planning a session dedicated to some of the most important pathological conditions encountered in their country. Africa is, of course, not a country, but a whole continent. There have already been some African countries as ESR meets partners during the past years, but we have seen that the number of ESR Associate Members from Africa is growing, and we believe that this invitation will be a chance to increase our knowledge about radiology on the whole continent and an opportunity to meet colleagues from countries that we still do not know. The session will discuss problems and strengths of our discipline in eastern, western, and northern Africa and will underline the reciprocal cooperation between European and African radiology. It must be remembered that all sessions will include some "interludes" showing nonradiological aspects of the invited countries: These have to be a surprise and cannot be disclosed. Collaboration with other specialties and partner disciplines is a major aim for the ESR, as reflected in the growing number of joint sessions at recent ECRs. Which collaborations are planned for ECR 2019? One of the most popular and interesting sessions at ECR are the multidisciplinary sessions, in which radiologists and clinicians, together, discuss their diagnostic and therapeutic approach to patients with a specific pathologic condition. Each team comes from the same hospital so that the discussions among them are the same that they would have during their daily clinical practice. Next year, we will deal with patients affected by foot complications from diabetes, those with thyroid nodules, and those with pulmonary cancer. The impact of the work of the radiologist is maximized when there is close cooperation with clinical colleagues. Each year, ECR brings to the attention of its attendees three clinical situations in which this can be seen on both simple and difficult cases, as happens in real life. We hope we have chosen topics that will prove interesting and useful to our audience. Furthermore, we are planning a session dedicated to digital pathology. It will show us how and for what purposes digital technologies can be used in this discipline and will discuss how to use them in (again) a multidisciplinary way. It will especially explore if it is possible to have the same archive platform to store and distribute both pathologic and radiologic images and how to gain benefit from this. Participants will come from two hospitals in which this is already in use; there will be both pathologists and radiologists sharing their experience on how this has changed their work in clinical practice, teaching, and research. Specific attention will be given to the added value provided by the availability of both types of images during multidisciplinary discussions on tumor boards. In addition, there will be joint sessions with the European Diploma in Radiology (EDiR), European Institute for Biomedical Imaging Research (EIBIR), European Society for Hybrid, Molecular and Translational Imaging (ESHI-MT), European Society for Magnetic Resonance in Medicine and Biology (ESMRMB), European School of Radiology (ESOR), EuroSafe Imaging, Professional Issues and Economics in Radiology (PIER), Radiological Society of North America (RSNA) ... and many more. You have been actively involved in the creation of the poster for ECR 2019. How did you choose this particular subject, and what does it convey to you? The ECR 2019 poster. Image courtesy of the ESR. Genoa is on the Mediterranean Sea, and we have one of the largest aquariums in Europe. It is both an entertaining and a scientific institution that attracts many visitors, even from abroad. Choosing the color of the Mediterranean as the background, with a number of fish swimming in it, was an easy choice. 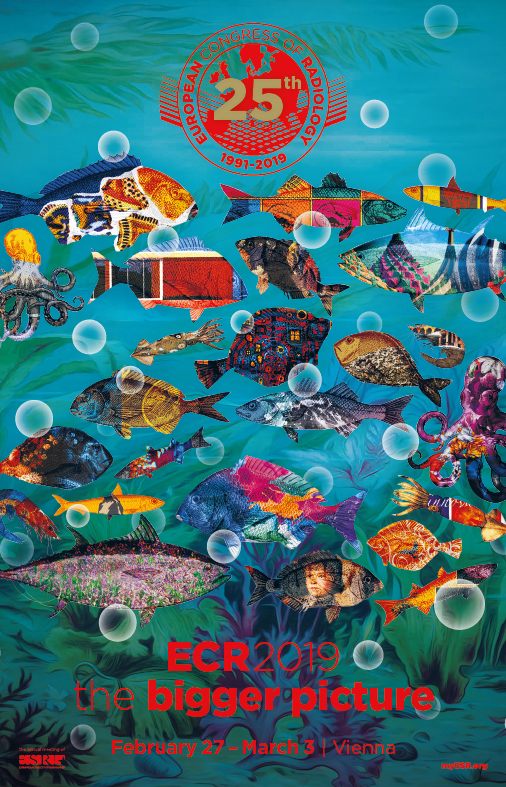 But, if you look more in detail, you can see that each fish has been designed with the colors of one of the posters of the past ECRs and that they, together, delineate the number 25. Furthermore, the number 25 at the top of the poster and the logo surrounding it are written with the same font used for the ECR posters of the first years. These details try to recall the past and to underline that the new congress is carrying on along the same lines as earlier ones. Again, the concept of continuity of ESR's activities over time (and over presidencies). I hope this will be understood while looking at the poster and that people will like it as much as I do. As ESR president, your most obvious focus for the next 12 months will be ECR 2019, but you will also have numerous other responsibilities. Can you tell us a little about your official duties for the year? The president of ESR has to prepare and chair the annual congress of the society. And this is the main job. Being president, however, also means representing the society. This is especially important at the meetings of the many radiological societies, both within Europe and on other continents with which we have relationships. When invited, we usually give a presentation on what ESR is and on the services it provides to its members, underlying specifically the relationships we have with the host society; furthermore, we discuss the results of past common projects with their boards and start developing new ones. This is something that cannot be done by one person only. Each member of the board of directors and the executive council of ESR shares the same task, each according to his or her possibilities. I have been to many meetings to represent our society in the past years, when the president could not go, and I already have an agenda full of commitments of this kind for 2018. To finish on a personal note, what made you choose radiology over any other medical specialty? And how would you "sell" radiology to medical students? Well, during the fourth year of my medical studies, I was an intern in general medicine, and the professor had given me the task of following the radiological examinations of patients in our ward. Then, each morning I used to go to radiology with the requests, and each afternoon I returned there to get the reports. Sometimes I was attending when the radiologist in charge was compiling the reports but, I have to admit, I was not too much attracted by this work. One day, however, he opened the drawer of his desk where he kept a collection of hand radiographs and started explaining what each image showed and how it was possible, based on the analysis of the radiological findings, to understand the specific disease of each patient. This made me decide I wanted to learn to do the same. What made me choose radiology was, therefore, the "intellectual challenge" of making a diagnosis from imaging findings: to recognize them, understand if they are related or not to the symptoms and signs of the patient, put them together, and see if they fit into the clinical picture and can explain it. I don't know the reason why this "challenge" attracted me so much. Maybe there is a relation to my love for detective stories, especially those of Sherlock Holmes, in which the principles of reasoning of the detective are quite similar to those of a diagnostician. I try to "sell" radiology to undergraduate medical students in a similar way: The last lesson of the year is structured like a film interpretation session and shows how the reasoning of the radiologist works while confronted with a series of cases. It has been especially prepared to try to develop "vocations" to radiology and, given the number of questions at the end, I can say that it seems to be working. There are a few other things that can be used to "sell" radiology: It is a specialty with something to offer to anyone. It is not only suited to the student who is, as I was, interested in the diagnostic process; those who want an active role in treatment can get involved in interventional radiology and be at the forefront of minimally invasive therapy. Furthermore, any organ and organ system is subject to radiologic specialization, from head to toe, and any special interest can be satisfied. Some students may decide not to take radiology because they consider it a specialty that takes you away from the patient. This can happen in some environments, but it is our responsibility as teachers to demonstrate that a good, active radiologist is one of the most important physicians for his or her patients and that close contact with them is key for obtaining good results in all radiological specialties, especially in breast imaging, interventional radiology, and all the applications of ultrasonography. Originally published in ECR Today on 4 March 2018.